To Vince Gilligan - My Star, My Perfect Silence. Are you as excited about the premiere of Better Call Saul as we are? 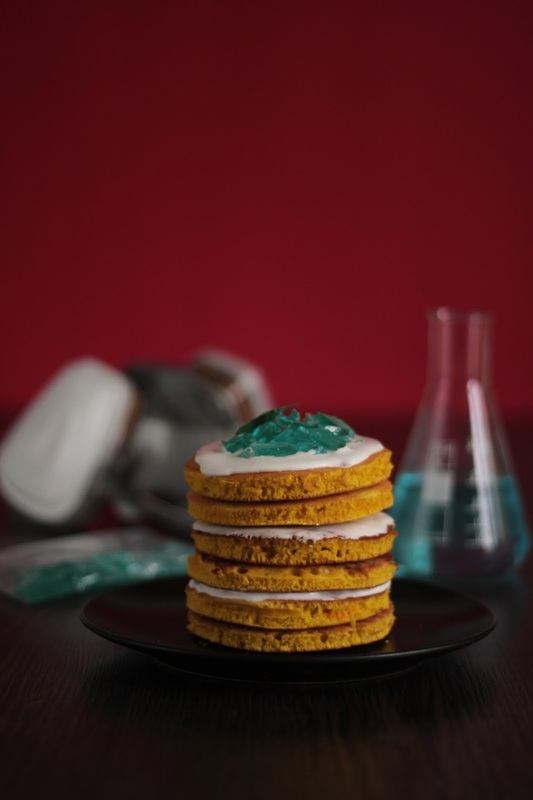 To honor Breaking Bad, the best TV show of all times and the upcoming spin-off we decided to come down to the Pancake Stories Super Lab and cook one last batch of the crystal blue persuasion. Our tribute to the series is a stack of 98% pure pancakes. They are so tasty and addictive, they should be illegal! 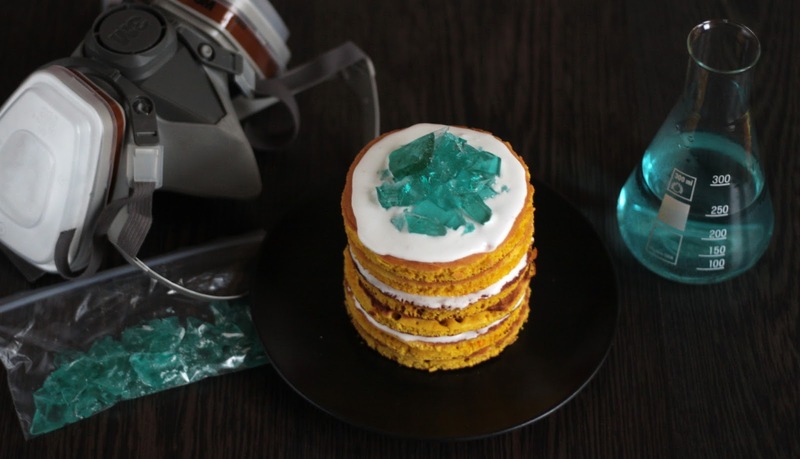 It took us (literally) 20 attempts to make the crystal blue sugar work. All the American recipes out there suggest using corn syrup as one of the main ingredients, but here in Germany it is very expensive and hard to get. The solution we found on the internet (just use homemade sugar syrup if you don't have real corn syrup instead) doesn't work. We hope our recipe will help people who are trying to find an alternative way to do this without expensive ingredients. 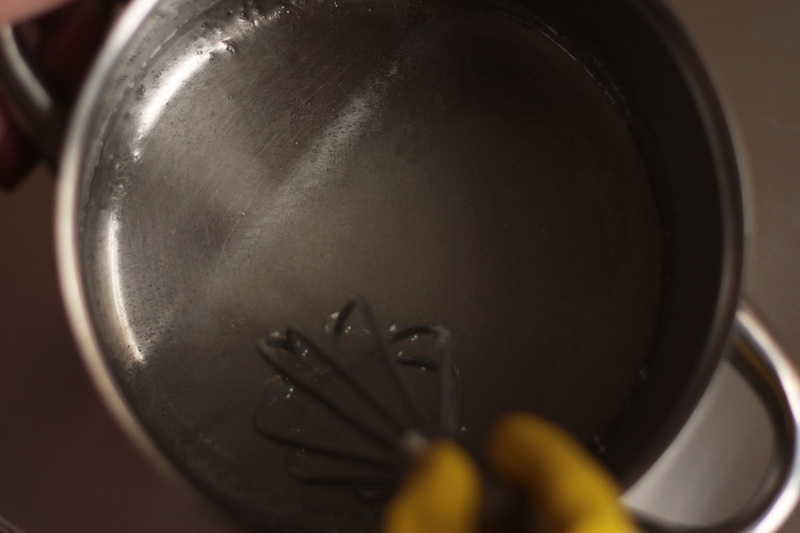 Put 250g sugar and 50ml warm water in a pot and stir it with a silicone whisk. Add 2 teaspoons of freshly squeezed lemon juice. The mixture needs to be warmed up on a stove with the lowest heat. You have to stir the ingredients lightly for 20-25 minutes. It is crucial to not let it boil! The mixture will not get completely clear after 20 minutes, it will look a little milky. This happens due to the tiny bubbles that emerge when you warm it up. You should be able to see the bottom of the pot though. Now tilt the pot a little bit. If the liquid doesn't have any sugar crystals anymore then you can go to the next step. 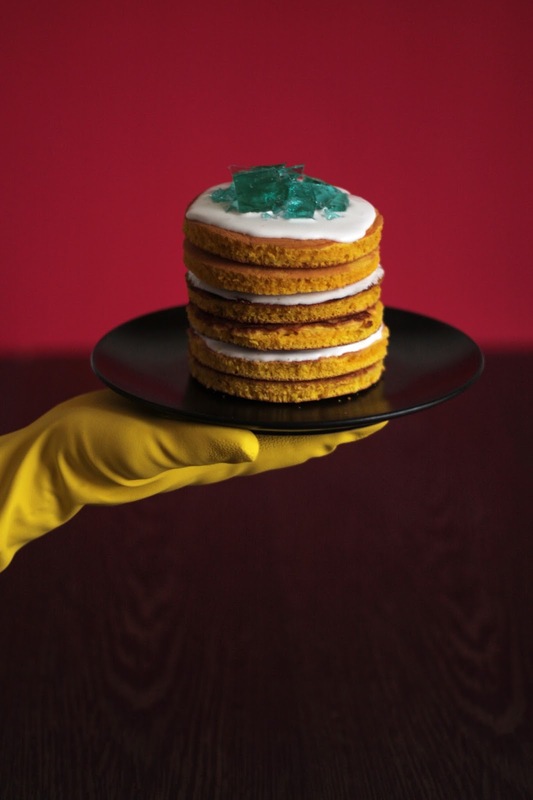 Now is the time to add the blue food coloring. 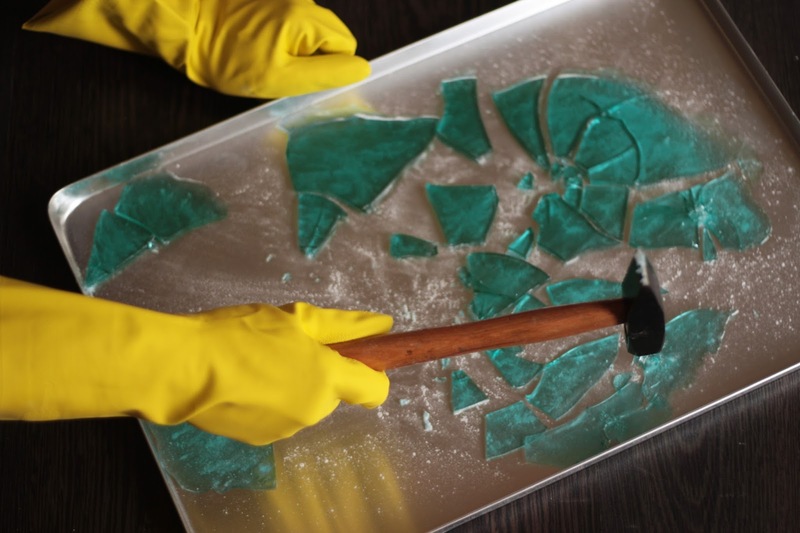 If you feel like adding some aroma (mint for example) make sure it doesn't have any color, or you might end up with green crystals instead of the famous blue tone. Stir, so the color gets even. Next you have to let the mixture boil (don't stir while you do that). Boil for approx. 2 and a half minutes, not any longer (the sugar will start to caramelize and turn the mixture green - just as in Heisenberg's formula, respect the chemistry and be precise when you cook). After the 2 and a half minutes take the pot off the stove immediately and set aside. Prepare a baking tray with some baking parchment meanwhile. 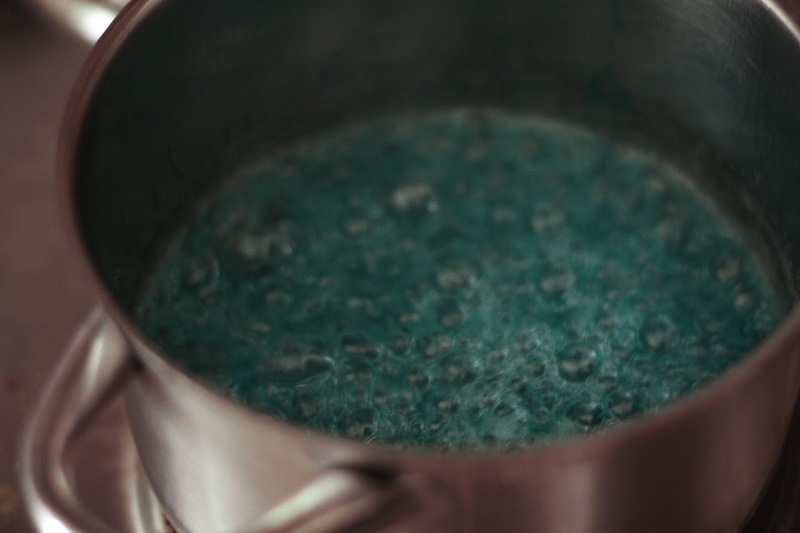 When all bubbles disappeared from the pot pour the blue mixture on the tray , try to make it even. It might appear green with the paper underneath, but don't worry, it is still blue! Now let the sugar cool down for an hour or two (until it is solid). Here comes the fun part. 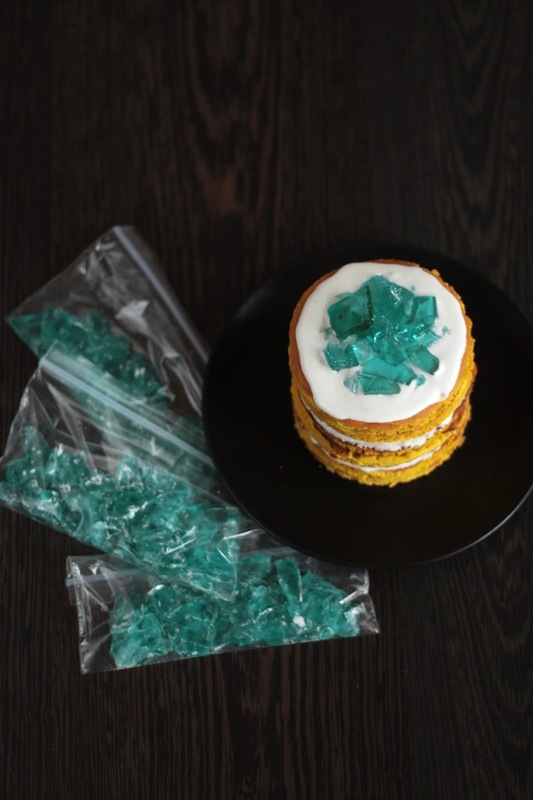 Grab a hammer and bash the sugar until you get crystals of desired size. Pour two tablespoons of starch on the crystals through a sifter, that will make them less sticky. Now they are ready to eat! Fill them in little plastic bags and use a couple of them for the pancake topping. Eat them on the same day - next day they will get really sticky. Separate the egg - but you will only use the egg white. Ina big bowl beat the egg white with the blender. Push 200g sugar through a sifter with a spoon. Blend. The end result will taste like marshmallow fluff! Don't eat huge amounts on it, this is still a raw egg, but as a topping for pancakes it is perfectly safe to eat. 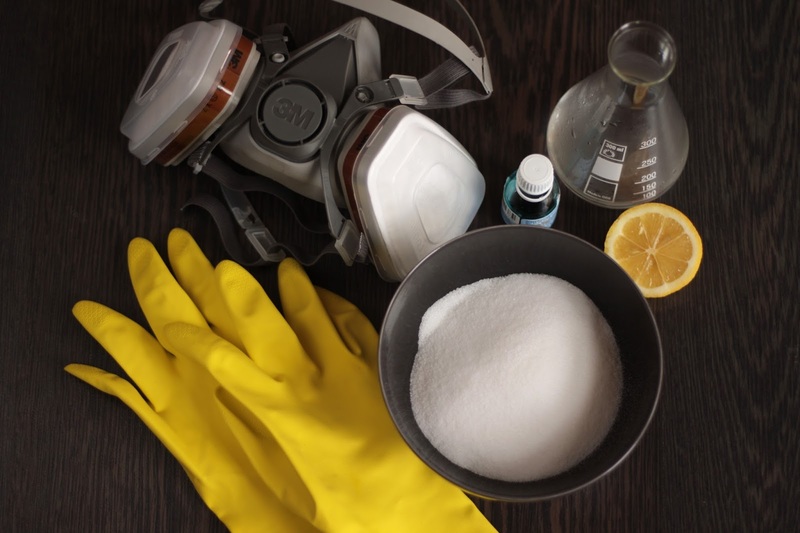 Start by putting flour, starch, sugar, baking soda and baking powder into a small bowl. Mix and set aside. Next separate the eggs and put the egg white into the big bowl and the egg yolk into another small bowl. Add melted butter (let cool down first) or oil to the egg yolk. Mix and set aside. Back to the big bowl - whisk the egg white and add buttermilk. Now add the butter-egg-yolk mixture and stir. 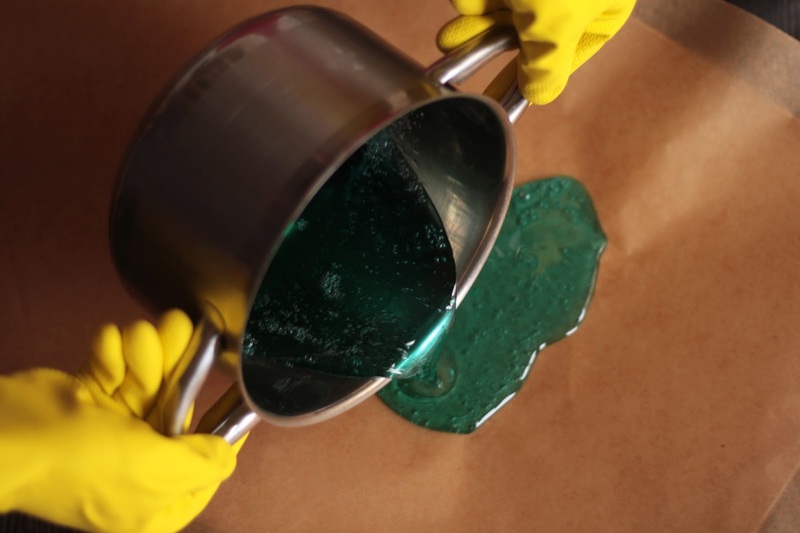 Now is the right time to add food coloring - the amount depends on which company's product you use, just add until you get the desired color. Finally slowly start pouring the dry ingredients into the bowl with liquids while you stir gently. Put the batter into the fridge for 20 minute. Meanwhile preheat the stove with a well coated pan on it. Don't use any oil. Start flipping the pancakes. When you are done put the cream between the pancakes and place the blue crystals on top. And if you get caught eating this delicious treat - Better Call Saul!